Halloween 2016 is fast approaching, which means pumpkins will be out in full force – sitting on your doorstep, decorating the local coffee shop or lighting up the neighbour’s window. Well, there’s more to this orange fruit than Halloween and sugary (but very tasty!) desserts. Pumpkins have numerous health benefits – none of which are highlighted during the Halloween excitement. So when you’re carving those pumpkins or making a delicious pumpkin pie, don’t forget about the nutritional snack inside—the seeds. 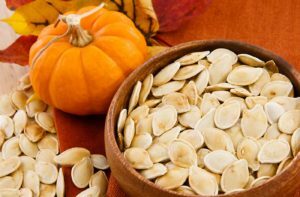 Pumpkin seeds are highly portable and require no refrigeration, so this Halloween before throwing the seeds in bin, save them for a baby-making nutritious snack! Seed the pumpkin: Preheat the oven to 300 degrees and using a spoon, scrape the pulp and seeds out of your pumpkin and into a bowl. Clean the seeds: Separate the seeds from the stringy pulp, rinse the seeds under cold water, then shake dry. Dry them: Spread the seeds in a single layer on an oiled baking sheet and roast for 30 minutes to dry them out. Add spices: Toss the seeds with olive oil, salt and your choice of spices – return to the oven and bake until crisp and golden, for about 20 more minutes. Sweet: Toss with butter, sugar and cinnamon and honey. Spanish: Toss with smoked paprika and mix with almonds after roasting. Italian: Toss with olive oil, Italian seasoning and red pepper flakes. Cheesy: Toss seeds in butter then in cheese and pepper.